INCREDIBLE FIRST-TIME BUYER/INVESTOR OPPORTUNITY - 2 BEDROOM, 2 BATH WITH GUEST UNIT PRICED UNDER $600,000! 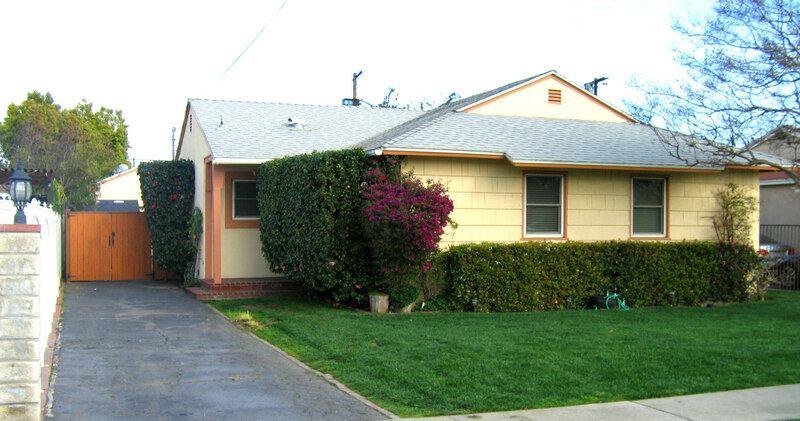 Located in a nice neighborhood of North Hollywood, just North of Victory Blvd. and just minutes from Burbank, this sharp 2BD, 1.50BA home with a detached Guest Unit offers an incredible value in today's market! The main house consists of 1,135 sq. ft. (per Assessor) and features an "open concept" floor plan, as a previous owner had removed a wall and small former third bedroom to create an open and free flowing Living/Dining area adjacent to a beautifully remodeled Kitchen. The Living/Dining area features a mantled fireplace, hardwood flooring, recessed & track lighting, fresh paint and an expansive sliding glass door and window exposure that provides abundant light, as well as access to the pleasant rear yard and patio area. The Kitchen has been beautifully remodeled approximately 3 years ago and offers gorgeous quartz counter tops & dining bar with glass tile backsplash, handsome custom maple tone cabinetry, tile flooring, recessed lighting, dishwasher, as well as a laundry area separated by a pocket door complete with laundry sink and a newer Half Bathroom. (All Stainless steel Kitchen applicances - Gas Stove, Refrigerator and stackable Washer & Dryer are included in sale!) The entry area of the home offers a built-in cabinet and leads to the two Bedrooms and a Full Bathroom (with shower over a tub) and newer vanity and sink with granite. The bedrooms also feature hardwood flooring, nice closet space, with mirrored sliding doors in one, ceiling fans and have been freshly painted. The large, pleasant grassy rear yard is completely fenced and offers a serene entertainment space with it's newer covered patio with recessed lighting and BBQ area. The double detached garage has been converted (without permit) to an approximate 400 sq. ft. studio Guest Unit, complete with .75 Bathroom (with stall shower) and Kitchenette with refrigerator and gas cooktop (included in sale.) Where to store the usual garage contents? Don't worry, two large detached Storage Sheds, one in front of the Guest Unit and one behind it, are included in the sale! Additional updates include: Copper plumbing with two tankless water heaters, double pane windows (both main house & Guest Unit), central air conditioning and heating (main house only; window/wall combined air and heat unit a in Guest Unit), newer insulation in main house attic and automatic sprinklers in front and rear yards! Please contact Dan with any questions and to arrange a private showing!